According to NAHB analysis of the most recent Census data of Starts and Completions by Purpose and Design, single-family attached starts totaled 24,000 for the second quarter of 2015, up 26% from a year prior. Over the last four quarters, townhouse starts totaled 78,000 nationwide. The second quarter pace of townhouse construction is the fastest since the first quarter of 2008. Using a one-year moving average, the market share of new townhouses stands at 11.5% of all single-family starts. 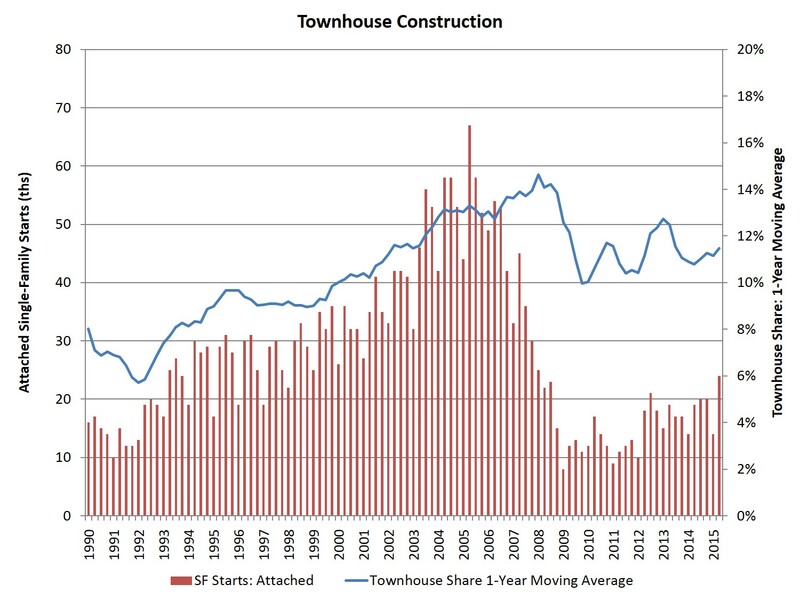 The peak market share of the last two decades for townhouse construction was set during the first quarter of 2008, when the share reached 14.6% of total single-family construction. This high point was set after a fairly consistent increase in the share beginning in the early 1990s. Despite the drop in market share during the Great Recession, the share for townhouse construction is expected to increase in coming years – with occasional ups and downs. For example, recent weakness in production has been associated with reduced levels of first-time homebuyers, although those trends appear to be improving. For geography concerning the existing townhouse market, see this post by NAR economist Scholastica Cororaton on market confidence for existing townhouses by state. The long-run prospects for townhouse construction are positive given large numbers of homebuyers looking for medium density residential neighborhoods, such as urban villages that offer walkable environments and other amenities.